Museum of New Zealand Te Papa Tongarewa. Any gamer worth of his/her salt is well acquainted with the term “Easter egg”. It designates any sort of secret message or feature (or even inside jokes) hidden in a video game or any other kind of software. The name is obviously based on the egg hunt game that many children enjoy during Easter. Nowadays, Easter eggs are everywhere, having spread from games and computer software to comics, TV shows, and movies. Some would even argue that they have gone too far and that we have reached a point where Marvel’s films have so many Easter eggs that they risk overtaking the main plot. Regardless, Easter eggs are something fun, that help to bring more color to any work, and are an important part of present pop culture; for instance, they are the very backbone of the novel Ready Player One. Thus, I would like to explore here the very first Easter egg in History. But first, let us see when the term was first applied. The early history of video games is a little more dystopian than most would expect. Atari Inc. was one of the major names in the industry back in the 1970’s. The games it developed and published were very influential, but changes in the company during the late 1970’s led to some critical changes. Anonymity was to become the norm at Atari: programmers would not be credited in their creations anymore, for fear that rival companies would identify and “target” them, luring them away with higher salaries (and maybe a nicer working environment). ― Robinett (in Conelly, 2003). 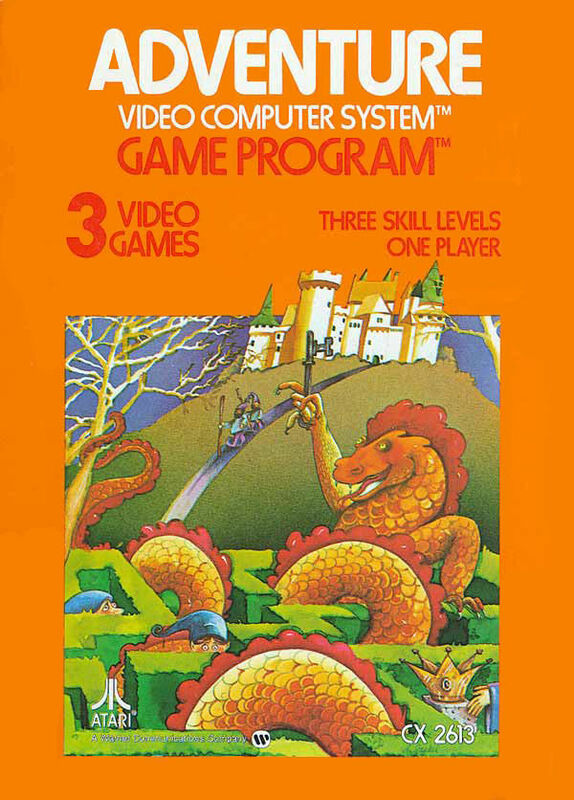 Cover of Adventure for the Atari 2600. Image retrieved from MobyGames (http://www.mobygames.com/). Robinett’s secret room was indeed not easy to find: the player had to collect an invisible item in the castle (a 1-pixel object now known as “the Grey Dot”) and use it to open a secret chamber deep in the catacombs. There, the player would find Robinett’s message, written in flashing text. After the game was released, Robinett kept his secret, but eventually an American teenager found the message and contacted Atari. The company at first thought of removing it, but this would be absurdly expensive. However, Steve Wright, Atari’s director of software development, had a moment of brilliant insight and pushed for the company to keep the message in the game. By his rationale, this hard-to-find secret would give players an extra reason to play the game, because it would be fun like Easter egg hunts. And just like that, the name “Easter egg” entered gaming culture: Atari decided to include Easter eggs in all their games and, by now, they have become a staple of the industry. Screenshot of Robinett’s Easter egg in Adventure. Image retrieved from Wikimedia Commons. Despite Robinett’s message being the one that gave rise to the name “Easter egg”, it was not actually the first one we know of. The very first Easter egg in gaming history was only very recently discovered: the message “Hi, Ron!” in the arcade game Starship 1 (Atari, 1977), programmed by Ron Milner. However, given that many arcade games were released prior to Starship 1, it is very likely that even older Easter eggs might be found in the future. But they will not be as old as the very first Easter egg recorded in human History. For this, we need to travel some millennia back in time. Flyer of Starship 1. 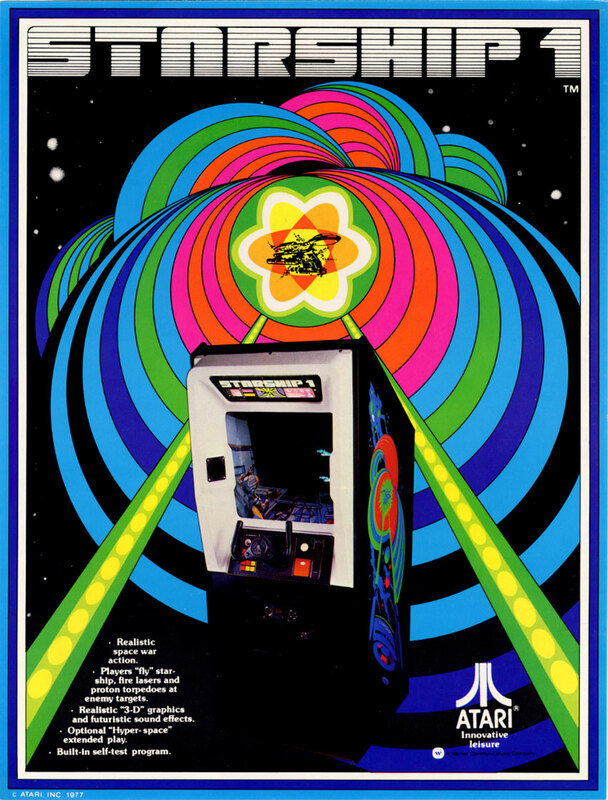 Image retrieved from The Arcade Flyer Archive (http://flyers.arcade-museum.com). Art in Ancient Egypt typically served religious or state purposes and very often, both of these realms were linked. Egyptian art was thus more functional than anything else and several artists were involved in the production of any single piece of art: from draftsmen and carvers to illustrators, painters, and scribes. Like in Atari, these ancient artists worked in anonymity, never being credited. This was, however, the norm, and was not seen as an affront to an artist’s creativity and personal work (as it was during the early days of video games). Even so, one of these ancient artists decided to credit himself. His name was Senenmut. 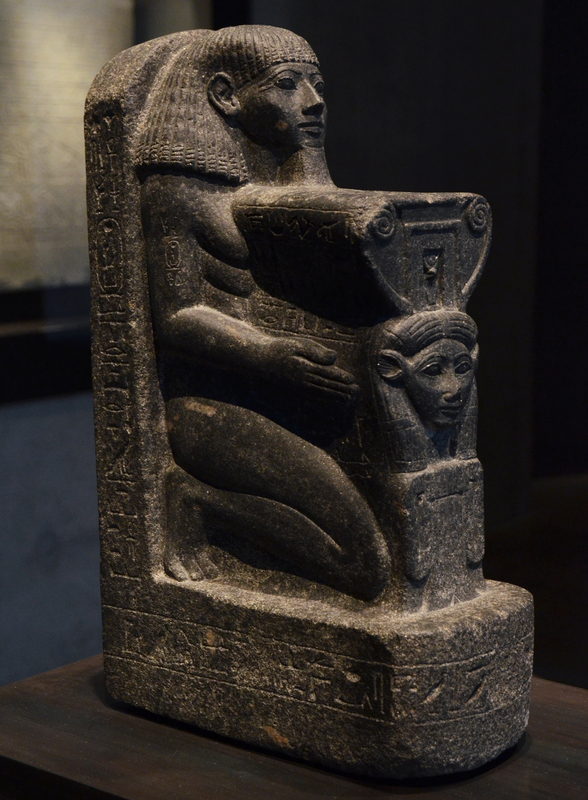 Statue of Senenmut (18th Dynasty, ca. 1470 BCE), held in the Staatliches Museum Ägyptischer Kunst (Munich, Germany). Photo by Vassil (2006); image retrieved from Wikimedia Commons. Senenmut was born a commoner, but in a literate family, which would put him in the upper 5% of the population. He entered the service of Queen Hatshepsut, of the 18th Dynasty, most likely when she was still the wife of Pharaoh Thutmose II. After the king’s death, Hatshepsut became regent while Thutmose III was still too young to rule the country. She then became de facto Pharaoh (even after Thutmose III reached adulthood) and ruled Egypt from circa 1478 to 1458 BCE. Senenmut obviously gained importance during this time: he was the steward of Hatshepsut and the tutor of her daughter Neferure, a highly-regarded position. He worked as administrator of Hatshepsut’s building projects and was also an astronomer and architect. Eventually, Senenmut would hold more than 80 titles, which included “Only friend of the Pharaoh”. The obvious important position of Senenmut and this seeming favoritism led some archeologists (based more on hopeful gossip than actual scientific investigation) to imply he was Hatshepsut’s lover. As an architect, Senenmut’s most remarkable project was Hatshepsut’s mortuary temple at Deir el-Bahari (in ancient Thebes, modern Luxor), on the West bank of the Nile close to the Valley of the Kings. The temple, also known as “Djeser-Djeseru” (“Holy of Holies”), is one of Ancient Egypt’s most beautiful buildings, designed in several different levels linked by ascending ramps, located against the cliff’s face. It would have been even more awe-inspiring back in Hatshepsut’s day, where a sphinx-lined causeway led visitors from the valley to its grandiose entrance, marked by large pylons. 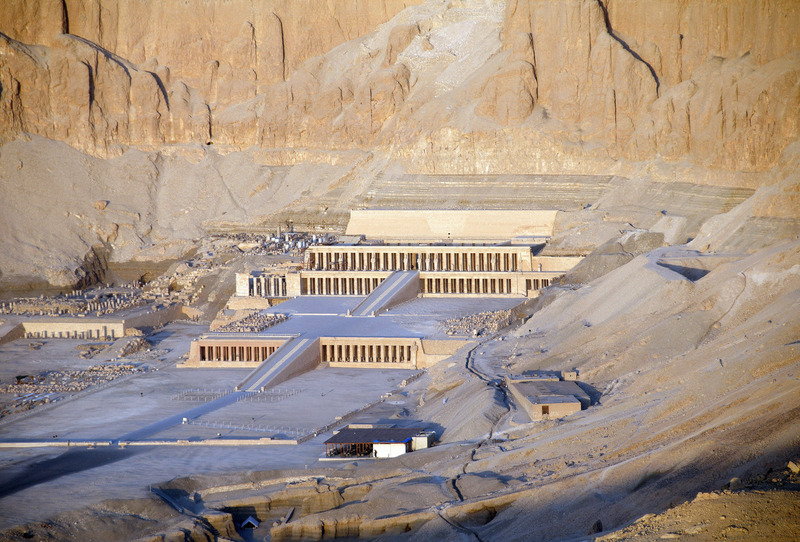 Mortuary temple of Hatshepsut. Photo by W. Hagens (2010); image retrieved from Wikimedia Commons. The curious thing is that, going against the practice of all prior (and later) Egyptian artists and craftsmen, Senenmut decided to sign his magnum opus. He hid his signature behind one of the temple’s main doors: his name and an image of himself. 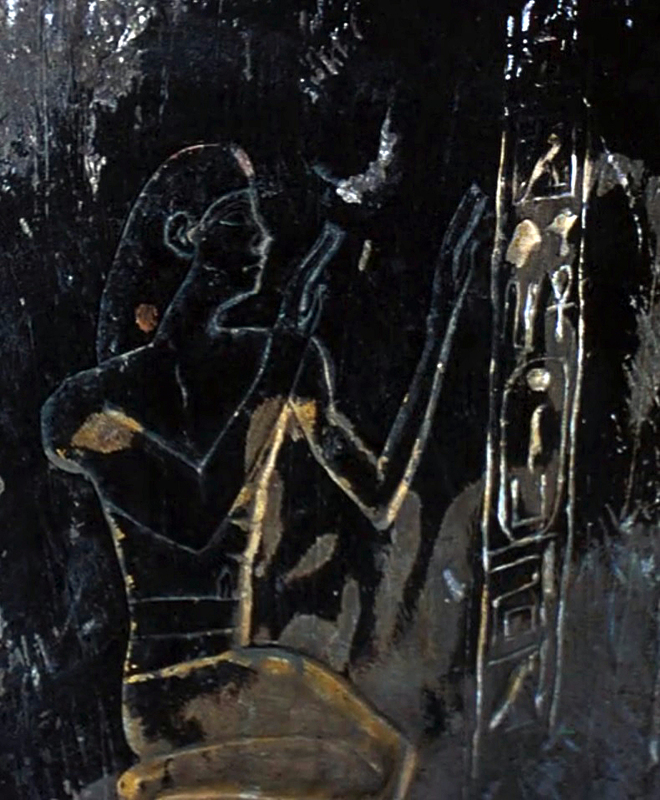 Senenmut’s signature: a relief with his image and name. We will never know why Senenmut decided to do this, but we can imagine that, given how remarkable a building the mortuary temple is, anyone would feel inclined to get recognition for it. So there you go, when Robinett decided to hide his own signature in a castle’s secret chamber, little did he know that a precedent had already been set 3,500 years ago: Senenmut’s Easter egg (not that Easter was already a thing back then, but you get the idea). Baker, C. (2015) How one man invented the console adventure game. Wired. Available from: https://www.wired.com/2015/03/warren-robin ett-adventure/ (Date of access: 13/Nov/2017). Bogost, I. & Montfort, N. (2009) Racing the Beam: The Atari Video Computer System. MIT Press, Cambridge. Cline, E. (2011) Ready Player One. Random House, New York. Conelly, J. (2003) Of dragons and Easter eggs: a chat with Warren Robinett. The Jaded Gamer. Available from: http://tjg.joeysit.com/of-dra gons-and-easter-eggs-a-chat-with-warren-robin ett/ (Date of access: 13/Nov/2017). Dorman, P.F. (1988) The Monuments of Senenmut: Problems in Historical Methodology. Routledge, London. Fries, E. (2017) The hunt for the first arcade game Easter egg. Kotaku. Available from: https://kotaku.com/the-hunt-for-the-first-arcade-game-easter-egg-1793593889?IR=T (Date of access: 13/Nov/2017). Hague, J. (2002) Halcyon Days: Interviews with Classic Computer and Video Game Programmers. Available from: http://www.dadgum.com/halcyon/ (Date of access: 19/Nov/ 2017). Machkovech, S. (2017) The arcade world’s first Easter egg discovered after fraught journey. Ars Technica. Available from: https://arstechnica.com/gaming/2017/03/the-arcade-worlds-first-easter-egg-discovered-after-fraught-journey/ (Date of access: 13/Nov/ 2017). Novaković, B. (2008) Senenmut: an ancient Egyptian astronomer. Publications of the Astronomical Observatory of Belgrade 85: 19–23. Robinett, W. (2006) Adventure as a Video Game: Adventure for the Atari 2600. In: Salen, K. & Zimmerman, E. (Eds.) The Game Design Reader: A Rules of Play Anthology. MIT Press, Cambridge. Pp. 690–713. Robins, G. (2008) The Art of Ancient Egypt: Revised Edition. Harvard University Press, Harvard. Schulman, A.R. (1969–1970) Some remarks on the alleged “Fall” of Senmūt. Journal of the American Research Center in Egypt 8: 29–48. Silverman, D.P. (2003) Ancient Egypt. Oxford University Press, New York. Tyldesley, J. (1996) Hatchepsut: The Female Pharaoh. Penguin Books, London. Wilkinson, R.H. (1994) Reading Egyptian Art: A Hieroglyphic Guide to Ancient Egyptian Painting and Sculpture. Thames & Hudson, London. Wilkinson, R.H. (2000) The Complete Temples of Ancient Egypt. Thames & Hudson, London. Wilkinson, R.H. (2003) The Complete Gods and Goddesses of Ancient Egypt. Thames & Hudson, London. Wolf, M.J.P. (2012) Encyclopedia of Video Games: The Culture, Technology, and Art of Gaming. Greenwood, Santa Barbara. Dr. Rodrigo Salvador is a zoologist/paleontologist and was trying really hard to write something more biologically inclined. Instead, he ended up writing his third consecutive article about Ancient Egypt. And now he will be off playing Assassin’s Creed Origins. The only other artist credited in Ancient Egypt is Imhotep, vizier of Pharaoh Djoser (3rd Dynasty). Imhotep was responsible for building the first pyramid, the “Step Pyramid” of Saqqara (2667–2648 BCE). Later, Imhotep was remembered as a great sage. Many centuries later, during the Late Period, he was worshipped as an actual deity, the patron of Medicine.